The next meeting of the Arbeitskreis Alte Medizin Mainz will take place on the 2nd and 3rd of July 2016. For further details see the homepage of the project [] and the announcement []. 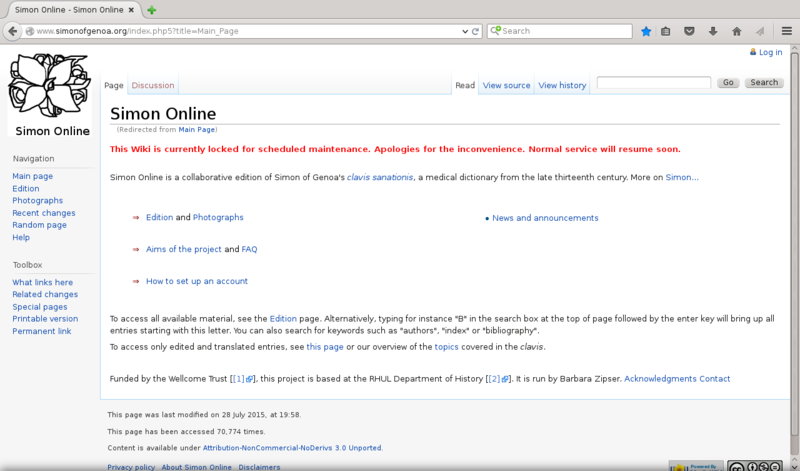 Simon Online is now being archived by the British Library within the UK Webarchive framework. All translated entries, including authorship data, are now being archived on webcitation.org. The Photographs has been merged with the old Sigla page, and scans of the 1473 Zarotus incunabula have been added. Simon Online has been updated. The changes mainly concern the categories Resources and Indices; a list of translated entries has also been set up. Blog review by Hestieia at Travelling with Demetrios of Skepsis []. Many thanks for this! This page was last modified on 25 May 2016, at 12:58.